Beijing marked a seminal event in the Chinese political calendar last week: the “Lianghui” or “Two Sessions.” The Two Sessions refers to the annual plenary sessions of both the National People’s Congress (NPC) and the Chinese People’s Political Consultative Committee (CPPCC), which coincide at the beginning of each year. On paper these events are given seminal importance, though how much of a role do they really have in terms of affecting Chinese political decision making? 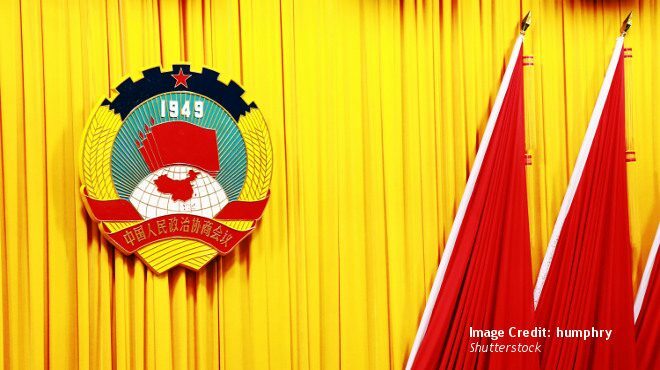 Within China’s somewhat complex political system, the NPC serves as State legislature and it is under such influence from the Communist Party of China (CPC), that it is often dubbed a rubber-stamp parliament. According to the letter of the law, the CPPCC should function as an advisory body to the CPC and is designed to include the nine official political parties, a selection of key industries and civil society organizations in the decision-making process, although the outsized role of the CPC affords scant room for major altercations or deviations. In theory, the annual plenary sessions allow for the promulgation of laws with input from representatives of the various groups deemed representative of the Chinese populace. More importantly, the annual event brings China’s political elite together to discuss policies amongst one another and then disseminate these motions upon returning to their home provinces. For political leaders it is also an opportunity to signal which direction the state intends to take in the upcoming year. One of the key areas discussed at this year’s Two Sessions are the measures to buoy China’s flagging economy and demonstrate the efficacy of the “Chinese governance system” as a whole. Much of China’s modern history has been characterized by rapid growth, resulting from reforms introduced in the 1980s. Since then, the country has made great strides in combating poverty and as Chinese officials are quick to point out, large numbers of citizens have elevated from destitution through the reform programs. Today many Chinese are experiencing their living standards improve first-hand. As a result, the CPC has sought to construct the social contract and the government’s legitimacy around its ability to improve living standards and economic performance simultaneously. So far, this formula has worked. China has seen substantial economic growth and to date managed to avoid the fallout of an economic downturn. While most of the world’s leading economies struggled with negative growth rates in 2010, Beijing was able to sustain an annual growth rate of over 10 percent. Today, however, the specter of another global recession might be looming on the horizon. For China’s part, this is due to domestic issues such as an aging population and its foreign trade disputes. Beijing is, therefore, feeling pressured to find ways to sustain the growth. The PRC has already been pursuing reforms to the Value Added Tax system, and the debates at the Two Sessions indicated that party leaders wish to push this development further. In the manufacturing sector, as well as related industries deemed important engines of wealth generation, VAT is set to decrease from 16 to 13 percent. The infrastructure and construction sectors, which play a key role domestically as employers and service providers for Chinese citizens, are set to experience a more moderate, but still significant, VAT reduction from 10 to 9 percent. At the same time, the Ministry of Finance will seek to spend around 386 billion USD to rail, road and water way construction, the majority of which will be paid for by the central government. Aside from increasing fiscal borrowing, Beijing still raises money by cutting government expenditure. This year general spending in administration sectors is set to be reduced by more than 5 percent. With official oversea visits, vehicles and hospitality to be cut by a further 3 percent, the goal is to demonstrate a clear determination to streamline administration and combat corruption. All these measures are designed to channel funds to improve people´s lives, especially through basic medical and health services. The state has pledged to increase medical insurance by an average of 30 yuan per citizen and improve the serious disease insurance. The latter is targeted to sustain the basic living standard of low-income households and eliminate the serious disease-driven poverty. Similarly, the CPC stresses an employment-first policy as a means to improve people´s wellbeing. The intensified structural conflicts in China´s current job market are becoming more apparent every year. To safeguard the employment rate under pressure from booming graduate numbers and changing industrial practices, China intends to create more than 11 million new urban jobs in 2019. A vocational skills training initiative will be implemented with 14.9 billion USD from the unemployment insurance funds allocated to provide training for an estimated 15 million people. China has set 2020 as the target year to win the battle against poverty and Xi has called for perseverance in the fight against poverty more than once, emphasizing that eradicating extreme poverty is a “must-fulfilled” endeavor. The central government has set aside 18.7 billion USD to fund poverty alleviation efforts in 2019, an increase of almost 19 percent from last year. The ambitious figures and promised reforms presented at the Two Sessions is part of an attempt to build confidence domestically and shore up the leadership’s position. This has gone hand in hand with increased government spending, while at the same time pro-growth tax cuts have been put into place. Whether this approach will allow the CPC to meet its goals and maintain the 6 percent growth rate it so craves, or whether the can has just been kicked further down the road, remains to be seen.